Julia Child was born in 1912 and died in 2004, just a few days shy of her 92nd birthday. There isn’t anything I can say new about Julia that hasn’t been said. What would the culinary world have been without her? I have already written many blogs about her cookbooks, and many more will follow. I thought instead I would guide you to my Pinterest board where I have over 200 photos of Julia, from a young girl until her death. I hope you enjoy them! In the second row, you will find a board called “Just Julia,” but look around at the other food boards, too. I have lots of my cookbooks posted along with other fun boards for the Pillsbury Bake-Off, favorite chefs, culinary adventures, and much more. Did you know there is a Julia Child Facebook page? I just discovered it and spend over an hour reading all the posts! What’s more fun that Julia? Happy Birthday, Julia! The world misses you. One Response to Happy Birthday, Julia! It’s a lazy, rainy day on Hilton Head. We’re dining in tonight, and it’s my turn to cook. Strip steaks with a red wine/mushroom/butter sauce and ratatouille made with vegetables from my garden and Julia’s recipe. 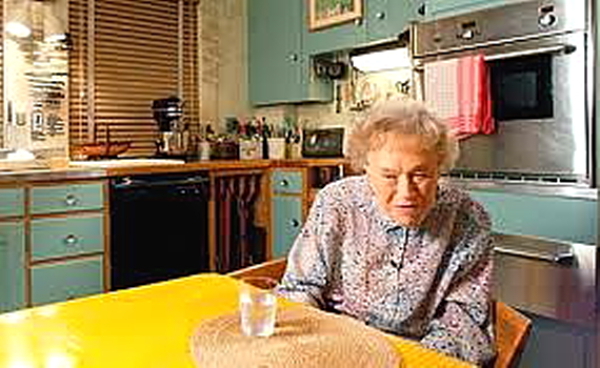 We’ll raise a toast to the woman who taught us how to cook and watch Julie and Julia.